I thought I’d celebrate the 20th anniversary of one of my favourite movies, Jurassic Park, by posting on, what is arguably, the most famous mosquito in cinematic history. As most people probably already know, the “science” of the story revolves around the cloning of dinosaurs from DNA samples obtained from prehistoric mosquitoes. The DNA was purportedly extracted from blood meals contained within these mosquitoes that had been trapped and preserved in amber. Even though studies have suggested that DNA wouldn’t survive long enough to assist in making “Jurassic Park” styled dinosaurs a reality, modern molecular techniques are quickly improving and may make the impossible a little more possible in the future. If we can improve the technology enough to make this happen, could the research team who receives the multimillion dollar grant please go to the trouble of hiring an entomologist? You don’t want to make the same mistake as the team led by entrepreneur John Hammond. I’m not just referring to the creation of nasty people eating dinosaurs. If you’re hunting around for mosquitoes in amber, you’d better pick the specimens that may actually contain blood! The screen shot above is taken from a scene in the movie (see YouTube clip below). The scene provides some background to the process behind dinosaur DNA capture. It has already been pointed out elsewhere that the mosquito specimen depicted in the video is a male mosquito. Male mosquitoes don’t feed on blood. Only female mosquitoes feed on blood, they need the nutritional hit to develop their eggs. Mosquitoes take blood from a range of vertebrates. Birds, mammals, frogs and reptiles. In theory, there is no reason why a mosquito wouldn’t bite a dinosaur. Blood meal analysis of mosquito populations in Florida during an outbreak of West Nile virus revealed that a number of mosquitoes were feeding on alligators (Alligator mississippiensis). The problem isn’t just that the mosquito depicted in the video is male, the type of mosquito shown doesn’t feed on blood at all! Not all mosquitoes need a blood meal. There is a group of mosquito species that belong to the genus Toxorhynchites. These are large, very beautiful mosquitoes that often have a metallic appearance. They are really the “good guys” of the mosquito world. Their immature stages are predatory. They are typically found in natural or artificial water holding containers such as buckets, bird baths, tree holes or discarded tyres. They tend to move in and eat through some of the other pest mosquitoes found in these types of habitats such as Aedes aegypti and Aedes albopictus. These mosquitoes spread pathogens such as the dengue and chikungunya viruses. Lets give credit to John Hammond and the team at International Genetic Technologies, perhaps it is samples from these mosquitoes that they were able to use to clone the prehistoric plants that were growing throughout Jurassic Park? If you’ve decided to go out and hunt down some dinosaur DNA, best look out for mosquitoes that actually feed on blood! Do we know that mosquitoes were even buzzing about with the dinosaurs? There is strong evidence, both preserved specimens in amber as well as fossils, that mozzies have been about since at least the Cretaceous Period. A paper by Poinar et al. 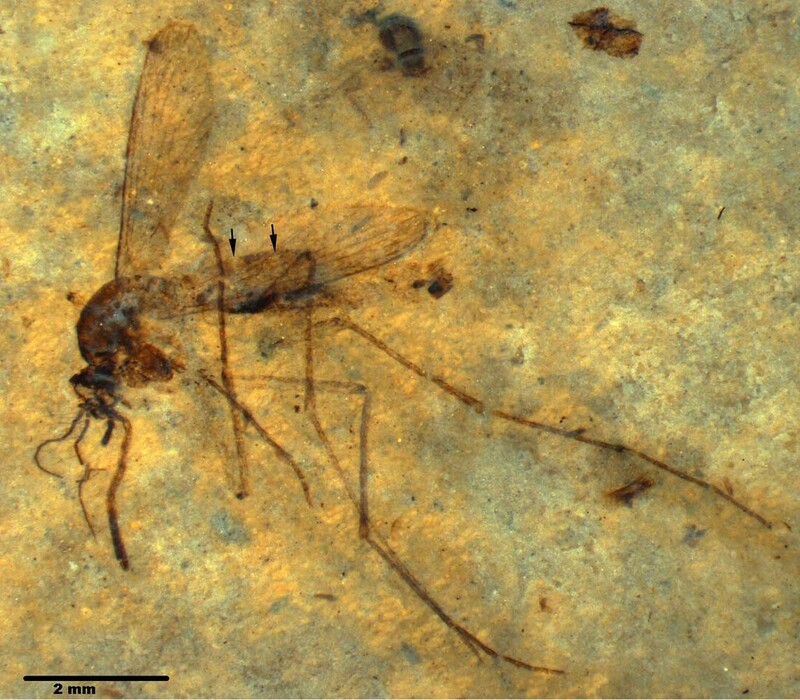 (2000), in their description of a small mosquito named Paleoculicis minututs from a sample of Canadian Cretaceous amber, provides references to almost 40 references to mosquitoes in the fossil record. Paleoculicis minututs was thought to have dated back to 66-100 million years ago but the oldest known record of a mosquito is Burmaculex antiqus described from Cretaceous Burmese amber (89.3-99.6 million years ago). Recently, two new mosquito species, Culiseta kishenehn and Culiseta lemniscata, were described from compression fossils in shale deposits dating from 46 million years ago. These fossils are pretty amazing as many of the morphological features we use to identify mosquitoes, such as scales and wing veins, have been preserved. There are mosquitoes related to these two species flying about today. There are thought to be almost 40 species belonging to the genus Culiseta. They’re generally considered to be associated to cooler-temperature climates. We have a few species in Australia such as Culiseta frenchii, Culiseta hilli, Culiseta inconspicua and Culiseta litteri. They tend to be associated with ground pools in forested areas. Although they will bite humans, they are rarely considered pests and have not been associated with the transmission of pathogens locally. However, related species are thought to transmit both Eastern and Western equine encephalitis virus in North America. Mosquitoes belonging to Culiseta, although they will bite mammals, are generally thought to prefer blood meals from birds. 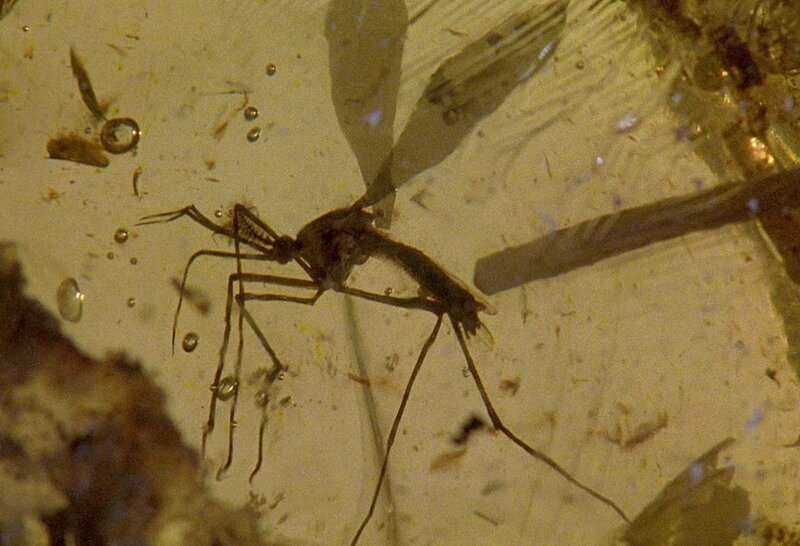 While it may be fun (and nerdy) to spot mistakes like this in movies, it is nice to be given an opportunity to dig back through the literature and have a closer look at some of the more unusual mosquito species and their place in the fossil record. Perhaps we’ll find some mosquitoes in Australian fossils someday too. I’m not aware of any mosquitoes identified from fossils found in Australia but there are research projects investigating insect specimens in amber. Fingers crossed. UPDATE. Wouldn’t you know it! Just as I hit “publish”, I notice that a similar story is doing the rounds today, something must be in the water!!! Joe Conlon has been reported in a few places reporting the same issue. Some more coverage here. UPDATE [15 October 2013]. Some more “mozzie fossil” news is making headlines today with the fossil of a blood-engorged mosquito in oil shale from northwestern Montana, USA, has been described in a recently published paper! The discovery of a mosquito (Culiseta sp. Culicidae) fossil clearly displaying an engorged abdomen from a recent blood meal has provided more evidence that mosquitoes were feeding on vertebrates as far back as 46 million years ago. Not only does the specimen look engorged, mass-spectrometry analysis of the specimen identified heme, the oxygen-carrying group of hemoglobin in the host’s blood. The study, publish in Nature, describes the discovery but also details the “extremely improbable event” that this fossil was created, let alone discovered tens of millions of years later! While discoveries like this still aren’t going to bring back the dinosaurs, they do confirm hematophagy in the fossil record. I wonder what other specimens are out there? 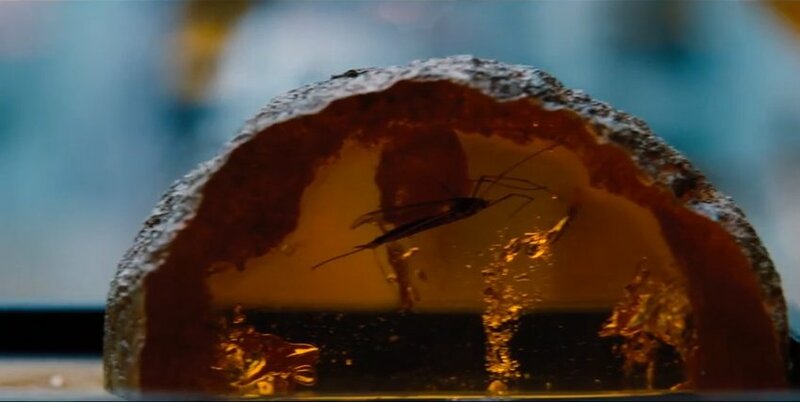 A screen shot from the Jurassic World trailer…is this supposed to be a mosquito? November saw the release of a trailer for the new movie in the “Jurassic” franchise, Jurassic World. As well as attracting plenty of attention from fans and media about the movie, it also attracted plenty of interest from dinosaur lovers and entomologists. 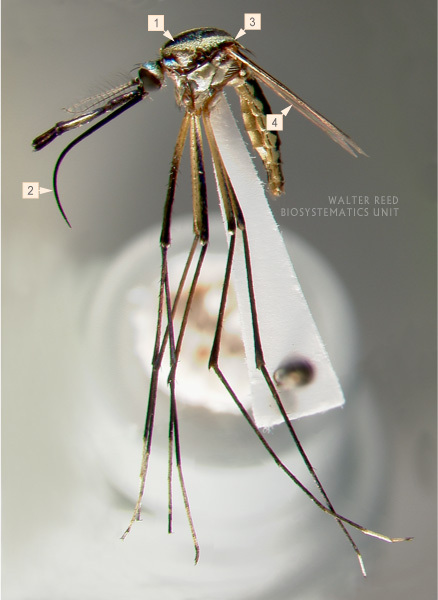 There was a great post by Dr. David Steen on some of the errors spotted by wildlife biologists and paleontologists and Morgan Jackson put together a nice piece on the entomological inaccuracies of the trailer (it is a crane fly, not a mosquito, locked up in that amber). Despite all of this, perhaps the biggest issue to have arisen is the purported unauthorized use of illustrations in accompanying promotional material. It would be silly to get REALLY upset about the mosquito/crane fly mix up but there was no shortage of people pointing out the mistake, you’d think they’d fix it this time around (unless there is a gag we’ll get in the movie about crane flies and non-biting mosquitoes). However, any opportunity to point out some scientific inaccuracies provides an opportunity to raise awareness of genuine scientific knowledge. I’m regularly called up to investigate “giant mosquito” problems….that almost always turn out to the crane flies (they don’t bite BTW). I’ll be heading along to see the Jurassic World monsters in 2015 but perhaps I’ll take the kids back to the museum to learn about dinosaurs and some of the other extinct Australian mega fauna for a hit of real science. Now, about that light saber in the trailer for “The Force Awakens”…. This entry was posted in Scientific Writing and tagged can you clone a dinosaur from mosquito blood, community education, dinosaur, dinosaur cloning, dinosaurs, dna, entomology, fossil, fossils, giant mosquitoes, hollywood, insects, jurassic park, jurassic world, mosquito, Mosquitoes, mozzie, outreach, research translation, science of movies, scientific writing, toxorhynchites, west nile virus, wetlands by cameronwebb. Bookmark the permalink.